FWIW, I just noted BLI's website has a refurbished E1 #2L identical to this for what I believe is a good price. I suppose the shell could be re-numbered. Yes, unfortunately the refurbished ones are the original sunset orange. I need the quantity of post war banner red ones. FWIW, I am attempting to pare down my locomotive roster which is at 23, as of today. I want to get down to 20 or less, as that is an inventory that I feel is just at the brink of overwhelming me with its' maintenance. That is also the amount that my Digitrax Zephyr Extra will allow to be stored in it's data bank, without having to release addresses. I know that some of you have huge inventories of locomotives and I think that you must not run all of them, as if you did, maintaining them would become the actual hobby your involved in. Maybe what I expect out of my roster is different than what other may expect. I want to have a high percentage of sound equipped locomotives. To have all sound equipped would be nice, however, finding space for a speaker in every one of my locomotives is a pipe dream and the hard reality of cost, is a bit overwhelming. I also expect them to run well across my track work which might not be the best it can be, even though I put in plenty of extra effort to make it so. My layout is thirty years old and things are starting to wear out. Also, simplifying my life as age creeps upon me, just seems to make sense to me! I'm envious. The closest thing I have to a sort of famous locomotive would be the Hiawatha 4-4-2 used in Bob Williams video of "Western Streamliners". Story I've heard of the D&RGW, but I cannot recall the source ... The Rio Grande was no stranger to the Challenger class of locomotives. They had their own L-105 class since 1937 and loved them. During the war effort they ordered more, but instead of the beloved L-105 type the war board dictated the UP design which were designated L-97. The Grand crews hated them. Down on both power and tractive effort, they did not handle the mountains well. Consequently the locomotives were not purchased but only leased until the end of the war. As soon as the war board let them end the lease, they were quickly shuffled off the to the Clinchfield. Your locomotive looks really good. I've not been brave enough to attempt to weather a steam locomotive yet. Mine is still glowing shiny black. Below I tried to get a shot of it with the neon Rio Grande sign in the background at the museum's "Rio Grande Days" a few years ago. 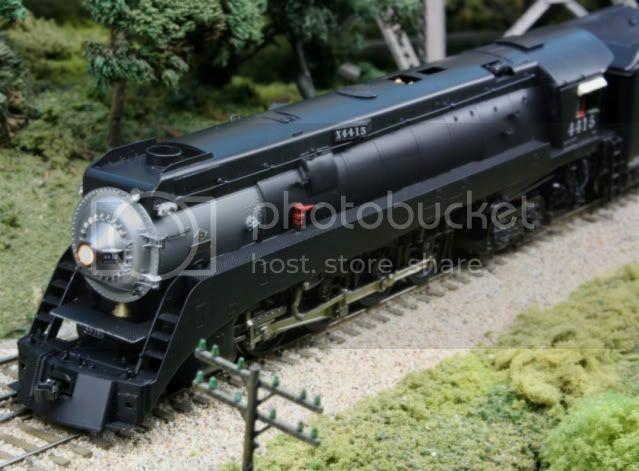 Mine didn't run for years and years because of them MRC brilliance decoder that Athearn put in them. I put it on the track. Dialed up channel 3. Drove it over to the programming track. Attempted to program it, and it wouldn't work. Wouldn't reset. Wouldn't do anything. I spent hours and hours trying every programming mode / reset sequence on several different DCC systems. Disgusted I threw it in a box and ordered a new Tsunami decoder for it. Years later, I pulled it out to begin the conversion. For some reason I put it on the track and ... It ran fine.?!? So it still has the original electronics. The museum layout has 44" minimum radius curves and most are much larger so I've not noticed the dual articulation effect at all. The reason the Rio Grande was unhappy with those Challengers was, they were designed for the long, steady grades encountered on the UP, not the steep, windy grades of the DRGW. They had lower tractive effort to slog up 3% grades, but higher horsepower to move faster up the 1.5% grades they were intended for. BTW, these were known as Jabelman Challengers, for the motive power guy on the UP that was in charge at the time. Earlier UP challengers were known as Fetters Challengers, for the same reason. You could sell off the surplus units, and use the proceeds toward soundizing several others. If you have some engines that are particularly difficult to put sound in, you could also sell those off, and acquire other, sound-friendly or equipped engines in their place--as long as those engines are not a mainstay of your roster, and unobtainium as far as sound options. Yes, I could and am doing such. The problem with some of what you suggest is the lack of Northern Pacific Locomotives produced by the manufacturers! I also heard or read a story where the locomotive name came when they were looking at the original specifications. One of the engineers involved said something like "That is going to be a real 'challenge'". hence challenger. I picked this one up at the Southern Pacific Historical & Technical Society convention. Needs paint & DCC. Locomotives could have their gear towers cleaned and a light lube applied and the locomotives placed into storage. I have many locomotives that are new in the their boxes and I don't plan on running them in the near future. When the time comes to run them I clean the factory lube and re-lube the gears. Today I'll run some locomotives that have been idle for a year or so and I don't expect any problems. Mark: While perhaps not era correct, could you "Patch" some locomotives for your Northern Pacific layout or run "Leased" locos? This could open up more possibilities for your roster. I picked this one up at the Southern Pacific Historical & Technical Society convention. I think Mikados are the most under appreciated locomotive on the railroads rosters. I believe they are the most numerous of all the modern steamers aren't they? A work horse slugging along while the articulated, Hudsons, and Northerns get all the glory. Good old Vanderbilt tender. Interesting trucks. They look like express trucks. I have no way of knowing if the Northern Pacific ever "Patched out" another owners art work, I'm modeling 1953 and I would severely doubt that this happened, back then. I was three years old back then, so my memory is "Patchy" on this; but, I would think if the N.P. ever bought someone else's locomotives in 1953, the first thing that would have been done is a new N.P. paint job. I have no problem painting and decaling another road's loco for the N.P., I've done it several times. Paint?? y' don't paint brass! Yer polish it. Wow, wish I'd of known this! Does it make brass more valuable? 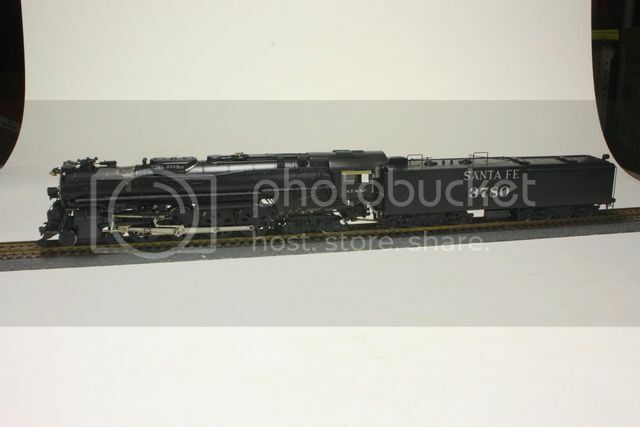 Iron Horseman, didn't the Santa Fe use some box cabs on the SuperChief, prior to the E-1? Do you have any model of those? They pre-date the warbonnet scheme, maybe from the mid to late 30's. I thought they were some of the first passenger diesels. Great topic btw! I'll be adding some posts to this thread. Espee fan, the GS steamer, almost looks like one of the WP's GS's. Did the single headlight predate the GS-4? Didn't the Santa Fe use some box cabs on the SuperChief, prior to the E-1? Do you have any model of those? They pre-date the warbonnet scheme, maybe from the mid to late 30's. I thought they were some of the first passenger diesels. You are correct. They were delivered August 1935 and remained in service into the 1950s. They were called Amos and Andy for some reason. They were an Oliveish green with saratoga blue roof and metallic red (pimpernel scarlet) accent striping and a black or cobalt blue sash at the bottom. I assume the green was to match the Pullman green on the heavyweight cars of the day. But for the day they were considered "richly plumed". There is great debate on the actual colors as there were no color photos only the manufacturers description. Once they physically proved they could handle the load and time table, that is when the Santa Fe ordered the E1s. They were contemporary with the UP M-10000, the B&M Pioneer, and the CB&Q original Zephyrs. They also only pulled the heavyweight cars for about 2 years. The lightweight streamlined cars started arriving on the Santa Fe in April 1936, but the Super Chief wasn't fully outfitted until May 18, 1937. No I do not have a model of them. 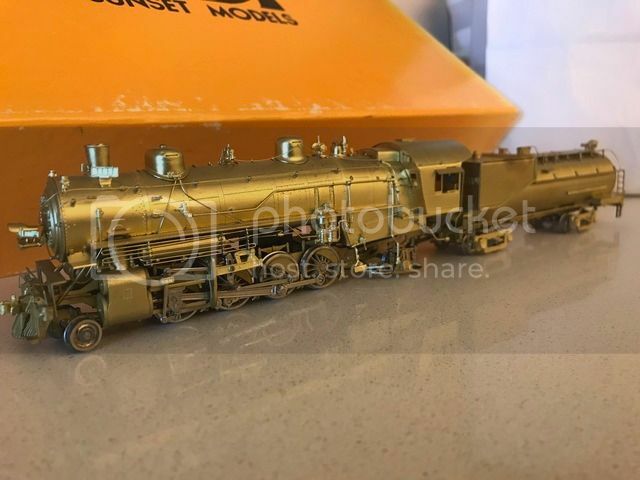 They have only been produced in brass and were so heavily modified by my time era, that they were unrecognizable (and assigned to the Texas trains). I believe Espeefan has a one. I know the NP leased the DM&IR Yellowstones occasionally but I don't believe they repainted them during the lease period. BTW the D&RGW also leased the Yellowstones. Must have been quite a thing to see such a massive locomotive so far away from home. Yes it did. That model is a GS-2, the first of the streamlined GS series. They got painted into all black pretty quickly, and moved north once the GS-4's showed up in 1941. You're thinking of the GS-6, which was a wartime design that reverted to the 73 inch drivers of the GS-2 but kept the GS-4's all weather cab. They never had skirts. I have a model of that one also, heavily weathered. Nope! I pull my heavyweight Super Chief with those E-1's. The available Amos & Andy sets are. as Iron Horseman says, later depictions, and many have been painted into the War Bonnet scheme. I'd need an as built set in the original scheme, and if these have been done they are way too expensive (think four figures and the first number isn't 1!). If I was going to drop that kind of serious money on a model it would be something SP, probably something by Challenger Imports or Glacier Park. But it ain't gonna happen!